Your honeybees are beginning to increase brood production. The queen bee is laying more eggs, and soon the baby bees will be hatching. If your hive does not have enough food, your bees could be in trouble. So, go check each beehive. You can heft each one to see if the beehive is the proper weight. If you think a beehive is too light, then you will want to give them something to eat. If you are overwintering Warre Hives, each hive should weigh at least 26 pounds (12 kg). If you hive is lighter than that, you probably need to feed your beehives. Feed your bees honey, if you have some. Just put it out in a dish, or bucket. Maybe add some sticks for the honeybees to stand on. When feeding honey, never use store bought honey! Store bought honey can contain contaminants and is often heat treated. Use your own honey or honey from a local beekeeper. If the weather has changed in your area, you can feed your honeybees some sugar water. Just mix about 1/3 sugar to 2/3 water. You can also feed about 1/2 water and 1/2 sugar if you want a stronger feed mix. Only feed sugar if spring has really sprung. Just keep in mind that sugar water is not very healthy for your bees compared to honey. Also, do not feed sugar if it is still cold and wintery in your area. Doing so could cause dysentery. I put out some of my own honey for my bees. They are really enjoying the tasty winter treat. You can see them buzzing their thanks in the video above. P.S. Thanks to my friend Robin for some extra tips I used in this post! This entry was posted in Beekeeping Advice, Honeybee Videos, Nick's Bees and tagged beehives in the spring, beekeeping, feeding honeybees, honeybees. Bookmark the permalink. Firstly I must congratulate you for this blog. Secondly I fear that by putting honey in front of the hive robbing might occur, that is you might feed the bees of an apiary close to yours, or the stronger families might attack the weaker ones. Warre designed some kind of feeder. You don’t use it? iosif – Thanks for your comment. Yes, Warre did design a hive feeder for the Warre Hive. It fits nicely under the quilt. However, I don’t use it when I am spring feeding since I don’t want to disturb my beehives. I’ve never had a problem with hive robbing in the early spring. My bees will definitely rob honey in the early summer…but not in the early spring. Thank you for you answer. I hope your right because I’m going to do just that: put honey in front of the beehive. In the end it is much more easy for the beekeeper and also more natural for the bee, because it resembles a natural nectar harvest. Would it be good for the brood to add some protein (pollen) to the honey? iosif – Yes, pollen is good for the brood. However, it may be better to feed pollen separately instead of mixing it with the honey. Hi, Great site. I’m glad I finally found it. This will bee my first time raising bees. 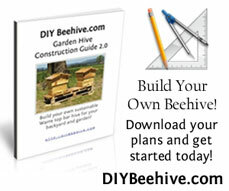 I built 2 horizontal tbh’s, then discover the Warre hive, so now I’m going to build 2 of them. I’ll be getting four 4-pound packages on April 1, I don’t have any honey or pollen, so would you suggest using pollen patties from say Dadant or Kelly’s and feeding sugar water. Had a question about sustainable practices and using sugar. Can bees simply survive on their own if the beekeeper only removes a small amount of honey? I’m hoping to not use sugar water come next spring. Rick – Thanks for your compliment. Yes, you can leave the majority of honey on your beehive from year to year. If they have built up enough stores, they will be able to make it through the winter. The bees will thank you for not using sugar water! I don’t use sugar water myself, only honey. And I like to leave a lot of honey on my beehives to ensure winter survival. I’ve learned so much in the past few weeks and my hive is doing very well. My plans are to not do anything with them to protect them from anything. It’s completely up to them. Just like it would be in the wild. I simply provide the home and protection from animals. No feeding, no wrapping and no chemicals to prevent pests. It’s going to be them that makes a go of it. Hope I don’t regret this, but I don’t think I will. Rick – That sounds like a great approach! I would suggest you might want to wrap your hives if you have very cold winters. Hive wood is thinner than a tree or stump, so you may want that extra insulation if you live towards the north. Nick: I have a newly started hive just a few months old. I am tring to do the best for the the bee’s, however I fear it is not enough for my limited knowledge. I have been fedding them sugar water. Now it seems they are doing battle with robbers on a daily basis. I have reduced the enterance to a very small opening but feel my bee’s need more help. What can I do. HELP! I am also very new to beekeeping, but I have spent the Winter reading so hope I am ready for the spring! I was given my hive by a friend who became allergic to stings. They have been in the main brood box for two years with no intervention. Should I be encouraging them to move to a new box this spring- ie by putting a new box underneath and letting them move down. I have six empty, new, national hives. My husband got very enthusiastic last summer and built them for me. I would like to change to Warré or TBH but don’t want to waste all these boxes! Would it be possible to put top bars on these hives. They are smaller internal dimentions than the national because my husband used thicker wood for insulation. However they are not as small as the Warré. But the internal dimentions of Phil Chandler’s TBH is much larger. We can only fit 9 standard frames in. My husband can adapt the top to take top bars – and he can make the bars. I’d love some feedback on this from someone with a bit more experience. I have a lovely strong colony and don’t want to mess them up. I’d also like to increase to maybe three or four hives. We have lots of swarms around here but not that many backyard beekeepers. Most are commercial and don’t speak English. And of course totally committed to frames and chemicals!!! Just had a quick peek into the top box on my hive today as the bees were flying and very occupied with a little treat of their honey from last Summer. I have 2 national hives and I want to change them over to Warre. I have made the hives, waxed the top bars and am creating the solid ground to position them. I have a sturdy plywood square that has the outer dimensions of a national and have cut out a squre from the middle that is the same as a warre. Now do I put the Warre underneath or on top? I had planned to put it underneath – because it’s the natural way to work down and the bees would have to go through the new area to get in and out but a friend suggestedthat the brood would get chilled-any advice please? Hi Maggie, that sounds like a great way to convert your hive. If we were heading into winter I would wait but since spring is here and the weather is getting warmer, this is the best time to do it. I would add the new hive bodies to the bottom, as you mentioned the natural tendency of the bee is to build down. Your bees are pro’s at maintaining the temperature inside the hive and will make any adjustments they need to to keep the brood from chilling. I also add a dash of salt to avoid spoilage. Bees tend to move UP in the hive during the winter as they consume their stores of honey and have a tendency to NOT move down in the hive come spring. This can cause congestion. I’ve never changed hive types but from what i understand it would be better to try to have them move up into it by rotating your winter hive box where the main cluster was at the end of the winter to the bottom of the stack. Obviously if your bees didn’t move up during winter than you can just leave it as is. My general understanding though is that the bees work their way up through a hive and not down. Also, if you do move your boxes around be careful to not break up the brood into two different areas or they might not receive the attention/warmth they need. Obviously don’t try anything while you still have cold nights. although my bees are at the bottom of the hive, ihave opened the super and have found that the honey i left them at the end of summer about four to five kg have been all taken either down to the hive or eaten by the bees. all the waxis is still intackt but not asingle drop of honey. what do you think has happened, do you think think they will have sufficient supply of honey. What are the normal dimensions of a Langstroth Nucleus? I’m asking again because I’m confused. What do I need to do to one Warre to receive the Nuc that I’m getting? Or What do I need to do to the Nuc without upsetting the bees? Thanks for posting this – there seems to be a lot of confusion about what’s best for the bees. I can tell you, sugar is not good for bees or humans consuming their honey… But, there is a predominance of posts insisting on it (only factual sounding argument I found was – it’s less expensive – which is why so much illness abounds….we have other priorities. I appreciate the truth in your post and the seasonal information.